There's a 34 page discussion that's been going on for the past 3 months the on this forum following his progress daily. My longest trip section without resupply is 14 days, but I didn't carry 14 days of food the whole way. I reckon good route planning is key. I enjoyed a full traverse of the Western Arthurs, then walked to Melaleuca along the Port Davey track. 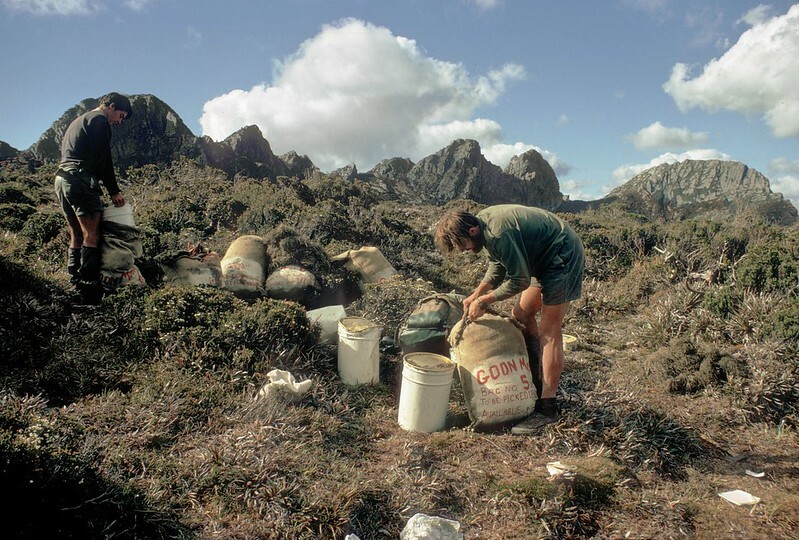 Later, after resupply at Melaleuca, I walked the South West Cape Circuit. I carried everything just 8klms, then stashed 4 days of food at Junction Creek for the Port Davey Track section, so I only carried 10 days of food up Moraine A.
I wasn't sure how I go, particularly those first few kays from the trailhead, but it all worked out fine! I've currently got a trip spreadsheet going for a 19 day section without resupply in the Arthur Ranges, but every time I look at it I fell rather scared! Haha intially I thought that was a huge sack full of goon 'cheap cask wine'. The good old days..where you'd drink a couple of litres of wine at camp and wake up feeling fine and ready for that 20km carrying a canvas pack weighing 25kg. Wait...that never happened..I never woke up feeling fine..